A cyanotype print works on a dye-based ink system, which makes it particularly effective for printing onto fabric. Silverprint does a beginners’ kit that includes all the required materials: a brush, digital contact film, paper, ready-mixed chemicals, tray and gloves. The only extra requirement is a plain T-shirt. Briefly, to create a large-scale negative, invert a positive digital file using editing software and print onto acetate (also known as digital contact film). Ready the chemicals and paint them onto the print area of the T-shirt. Place the negative over the T-shirt, with a sheet of glass on top of it to hold the negative down firmly, and then place outside in sunlight. You can get an idea how long is needed for an accurate exposure by doing a test strip over the negative. When the T-shirt has been exposed put it in cold water for 5 minutes to wash the chemicals off, and then hang it to dry. Being such a popular phone and camera, it may come in handy to distinguish your iPhone with a personalised photo case, using one of your own images. Your image is printed onto a case that is available in gloss black, white or clear. The case fits the iPhone 4 and 4S. Moo specialises in producing business cards. The website has a great number of templates to choose from, but the best option for creative control is to create your own card from scratch. The whole process takes just a few minutes, from importing and resizing an image to selecting the texts, graphics and colours. A free sample pack of 10 cards is available in ‘classic’ or ‘green’ paper stock, but the company has recently launched its premium ‘Luxe’ cards (£28.79 for 50 cards). Combining four layers of superfine paper, the cards are 3x thicker and heavier than most other cards, at 600gsm weight. Most importantly, they look great too. Printing an image onto canvas is expensive, but you can make your own for a fraction of the cost. Photofuse offers this all-in-one kit for creating a 10x8in canvas. The software includes simple editing controls and digital effects and will also align the image correctly on the paper when printing. Align the self-adhesive frame over the image before placing onto the canvas and the supplied brush is then used to ‘fuse’ the photo to the canvas, allowing the canvas texture to show through. Most of us have photos that have lived in the wallet for years and are now rather tatty. Photobox’s Wallet Cards are credit card-sized and made from a hard-wearing material, so your precious image will last longer. The pack includes two cards, each of which has the same image on both sides. There are many places to buy personalised clothing, but at a £12 a go they can be quite expensive, in themselves. If you own an inkjet printer, then the iron-on templates are more cost-effective for multiple T-shirts, at around £12 for a pack of 5 A4-sized sheets, or £16 for a pack of 20, with A3 sheets also available. Use an existing old T-shirt or spend less than £5 on a budget-level plain T-shirt and follow the simple instructions that are included with the iron-on kit. Birthdays and other major life events come around so frequently, and buying cards for every occasion can be an expensive business. At times it is difficult to find suitable and original cards too. Using your own images instead is therefore not only a great way of saving money and time looking for the right card, but also for showing off your work. On-linepaper.co.uk has a vast range of inkjet cards, with different weights and finishes. Each card is pre-scored down the middle for an easy fold, and is available in A4 and A5 sizes (halved when folded) and in packs of 25, 50 or 100. Pictured is the Fourdrinier (Baryta) Natural Fine Art card (£32.40 for 25), which has a pleasing 315gsm weight and excellent print quality for both colour and black & white images. As with any thick print material, check that your inkjet printer is able to print onto the material. Snapfish has an array of calenders in different forms, from those for the kitchen or the desktop to poster and wall types. There is a host of templates with graphics, illustrations or plain backgrounds, the latter of which I prefer because it does not distract from the images on display. Several photos can be put on the same page, which means it can take a while to ensure the calendar is well put together. A simple single image on a plain background is the quickest to compile, and looks great too. Image upload is easy if a little slow, but the final product is to a good standard and makes for a great gift to a loved one or to yourself. A Blurb ebook is created using a similar process to a Blurb book (see page 47 for more details) and costs from £1.49. Once created, the file can be sent via email as PDF for easy viewing on an iPad. Any conventional book made using the website Blurb (and purchased) can be converted into an ebook for free. For those who view their images and portfolios on an iPad anyway, this is a much cheaper alternative to a printed book. A magnetic ‘photo rope’ is both a quick and attractive way to display small prints, up to around 9x6in size. The rope here measures 1.5m and is supplied with seven mini magnets to attach prints. At one end of the rope is a loop to hook over a nail, picture hook or similar, and at the bottom is a spherical weight to keep the rope straight. 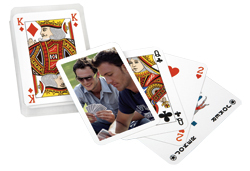 Each playing card has the same image printed on the rear, and the pack of cards, which includes three jokers, comes supplied in a clear case. Scour the internet, and it is clear that there are numerous mugs and cups onto which an image can be printed, but we like the new style of the ‘magic’ mug. It appears to be a plain mug, until hot water is poured into it, which causes the image printed onto it to ‘magically’ appear. 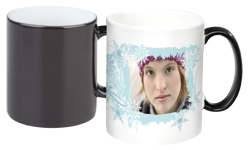 No one can claim my mug at the office any more – it’s got my face on it! For most households, if an image is to be seen regularly, the fridge is as good a place as any to put it. This ceramic magnet measures 84x54mm, with the print coverage over the entire coated front surface. A keyring is an item worth spending a little extra on for good quality. Many websites do a ‘crystal’ type, which has the image laser engraved onto it. 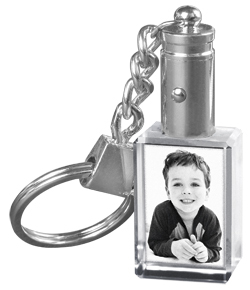 Furthermore, the keyring features an LED light, which is not only handy for finding the keyhole in the dark, but illuminates the engraved picture. This is a standard mousemat with non-slip protective surface. There is a choice between using an image that covers the entire mat, or choosing one from a number of themed and graphic-based templates, into which you can place your photo. 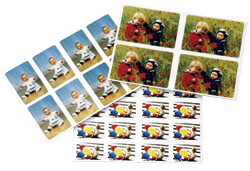 A single pack of stickers contains eight self-adhesive stickers, each printed with the same image at 25x37mm. 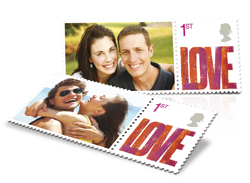 Give a first-class photo the first-class treatment by using it to send an item of post. The image is placed alongside the official stamp, in circular or rectangular form, and once uploaded it is automatically formatted to fit on the stamp.